Description: Drawing inspiration from the wildlife and natural beauty in the spectacular Adirondack Mountains. 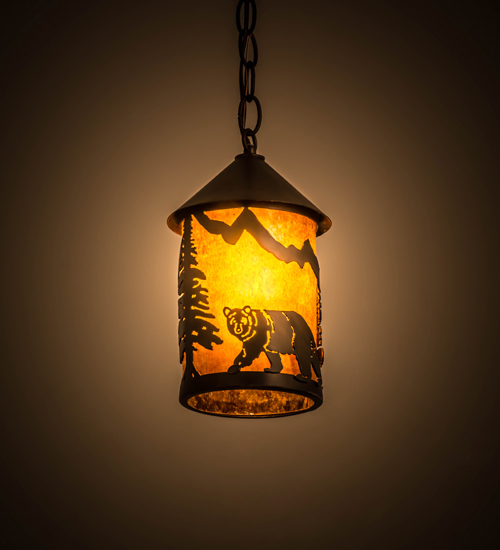 This stunning fixture depicts a bold Bear meandering across the mountainside. Beautiful ambient light is evoked through Amber Mica that is complemented with a frame and hardware featured in an Antique Copper finish. The overall height of this pendant ranges from 14 to 49 inches as the chain length can be easily adjusted in the field to accommodate your specific lighting application needs. Align this mini pendant in multiples to create a design statement over islands, tables, counters, and bars. Handcrafted in our 180,000 square manufacturing facility in Yorkville, NY. UL and cUL listed for dry and damp locations.